My great great grandfather, posing on his tricycle. And with his dog. I think this photograph dates from the 1920s. If you look closely, you can see that he has no right leg, below the knee. He lost this part of his limb in a railway accident as a teenager; an unsecured hay bale on a passing train caught him while he was standing on a platform, and pulled him under the train. The railway company offered him compensation, or a job for life on the railways. He took the job. At the time this picture was taken, he would have been working at Ringwood station in Hampshire (a station that no longer exists, along with the line it stood on). 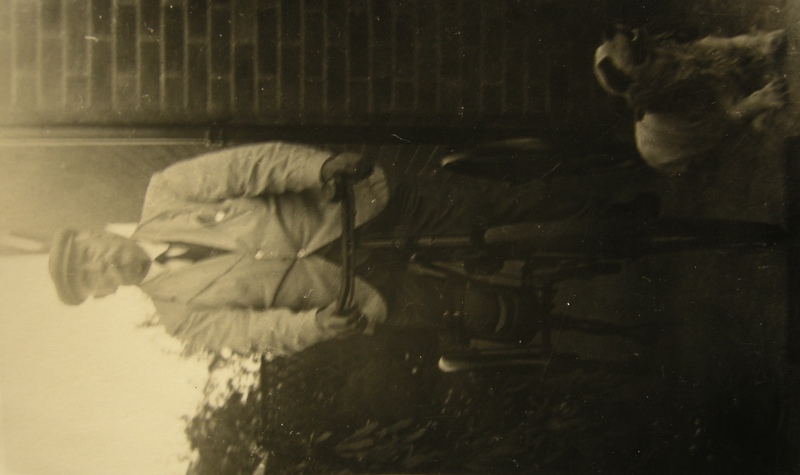 His daughter – my great grandmother – lived in the village of Bashley, just over ten miles away; he would frequently come to visit her, cycling the twenty mile round trip on this fantastic contraption. This can quite easily seem eccentric, or extraordinary, to us now; the fact that someone in the early part of the 20th century regularly cycled seemingly large distances on just one leg. But at the time it would have been deeply ordinary. The bicycle was still a commonplace, everyday, mode of transport, and would have been the way most people would have made a journey between Ringwood and Bashley. My mum joked – upon seeing my interest in the photograph – that ‘cycling was in the blood’ of the family; that somehow ‘cycling’ had been passed, genetically, down four generations. You could make a case. My grandmother was still cycling around Bashley well into her eighties. (She has now, unfortunately, been frightened off her bicycle, and indeed from walking along the road beside it, and is effectively housebound as a result – about which more in a later post). My mum also cycled regularly from Bashley to Brockenhurst college as a teenager – six miles there, six miles back. But this is of course where the ‘genetic’ explanation falters, because cycling slipped out of my family with my parents’ generation, as indeed it did with most babyboomers. I don’t remember seeing my parents cycling, beyond some very occasional ‘mountain biking’ with my dad. My own interest in cycling, as a mode of transport and as a leisure pursuit, into adulthood, is fortuitous, a combination of some chance decisions taken, and being in the right place at the right time. Statistically, I am a bit of an oddity. The great majority of my generation are like my parents – non-cyclists. The laboured point I am making – and the one which I made to my mum – is that decisions to cycle, or not to cycle, are almost entirely a product of environment, not of personal character. When my great great grandfather was cycling to and from Bashley, the roads would have been blissfully quiet. As the twentieth century progressed, however, those very same roads have changed. Thunderous lorries roar past my grandmother’s house; the short trips she used to make up to the post office or to the farm shop – barely half a mile – have become impossible. She wasn’t especially terrified, having cycled for so long, and until so recently. But, pragmatically, she realised she was becoming more and more wobbly, and the margin for error had become paper-thin. She wants to spend a few more years yet tinkering in her garden and kitchen, and so her bicycle has been abandoned. It now sits, forlornly, in her shed. A nice post that would be great with a bookending picture of grandmother’s forlorn shed bound bicycle. Not in the shed, but here it is, on a previous visit. I took it out of the shed for the photograph. My paternal grandad was a steelworker in Sheffield. During the depression, I am told, he was laid off or on short-time working so he did precisely what Norman Tebbit once advocated: he got on his bike. In his case, it was up to Lodge Moor, on the edge of the Peak District, with a contraption of his own making comprising a dustpan with a wire comb affair on the front, which he used to gather bilberries which we would then take back to the city to sell. My paternal grandfather was a civil servant. He embraced the motor car very early, with a “Bullnose” Morris. I don’t think environment was a real driver – maternal gramps lived near Leeds, a similar geography, but he has a job and a bigger wage packet. After that I started using my bike to commute to work and following one rather bad car accident I wasn’t allowed back on the insurance so ended up purchasing a proper full sus BSO for my commute! Started “proper” cycle commuting into the centre of London about 5 years ago now and have never really looked back (life saver shoulder checks aside ;-)) since. 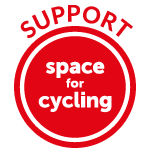 I have a few friends who still cycle including one who has now started commuting again, but most seem to have “progressed” to cars or use public transport. I don’t want to sound dismissive of your piece here, but anybody who knows anything about the science of emotional development could have told you this years ago. The best book on the subject IMO is, Why Love Matters by Sue Gerhardt from 2004 and it doesn’t have any particular relationship to cycling or anything else, but in fact, everything else. She went on to write, The Selfish Society, released just as the Tories came to power. This expands the emotional and social repercussions out into the political/economic realm and is IMO essentially, confirmation of Marxist theory of 150 years previously. The corollary of all this is that the consciousness determined by being is one of Capitalism in decay and the overriding economic imperative WILL NOT deliver anything like the sort of infrastructure that humans need to walk or cycle safely in the urban environment IMO.